Left to right: Eva Channells, Lise Barry and Christine Hopton - Gold Medal in Ski Relay. Photo by Chris McGuckin. Day 1 of National Teams Ocean and Beach Events concluded 1.30am Australian Time, Sunday 21st of September with Day 2 to come later today, 5p.m. our time - the Australian Open men and women in the Finals coming in first in Rescue Tube, Board Rescue, with either New Zealand or host nation France on their heels. The Italian and German team members have also been among points collectors so it's going to be a very exciting final day for the Opens competition with a few breaths held back here. Results for the Masters sees Eva Channells, Lise Barry and Christine Hopton from the Newport/Avalon Masters brightening everyone's week - and Avalon's Chris McGuckin collecting bronze in the board race and a 4th in the ironman, while Queenscliff's Masters Team have won so many medals in sprints, flags they will be coming home heavier even without all that wine and cheese. Collaroy Surf Lifesaving Club's Ross Langbein won Gold in the beach sprint, Dee Why's ski relay team the Bronze. Surfboat Results were still not listed this morning (2:14am Sunday 21st) - too much excitement perhaps? It is this passion that will save lives on patrolled beaches this Summer. On the Masters Day 1 Christine Hopton and Lise Barry won World’s Bronze in the Board Rescue, Chris came 4th in ski while Lise added a Bronze in the board, 5th in Ironwoman and a Silver in the ski. On Day 2 the ladies decided to go one better and collected Gold in the 150 years Ski Relay with Eva Channells. Newport’s first gold medal winner at the Masters World Inter Club Lifesaving Championships in France was Jeremy Rolleston who won the 40-44 years beach sprint final. Further north of us the Terrigal and Avoca Surf Clubs have been collecting Gold, Silver and Bronze while Branch clubs further south have also made Sydney's Northern Beaches Surf Lifesaving Masters Teams a stronghold of World Championship medals.... the list is as long as all those who went. Day 2 (21.9.14 - 5pm. our time) sees the final day of Pool events for the Youth Team and last day of Ocean and Beach for Opens. LIFESAVING WORLD CHAMPIONSHIPS, RESCUE 2014 (September, 17-21): Antigone Olympic Pool in Montpellier; Couchant Beach, La Grande Motte. 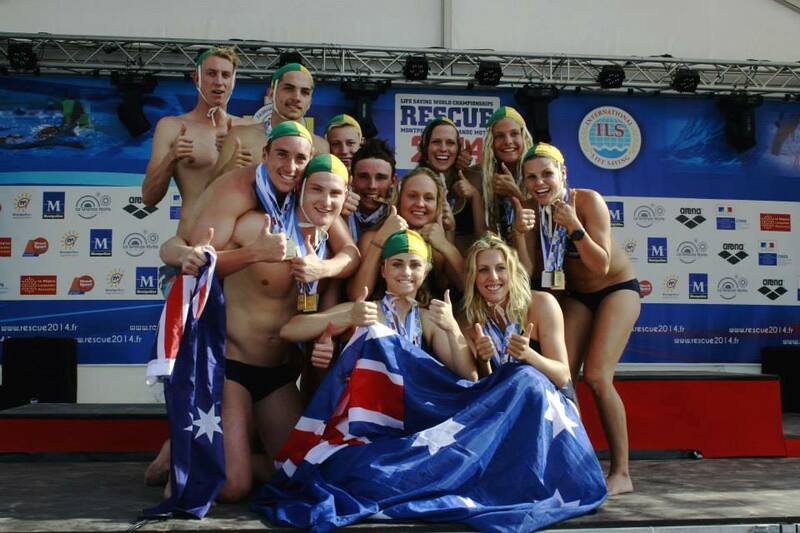 Australia will go into the final two days of beach competition at the World Life saving Championships, Rescue 2014 at Couchant Beach, La Grande Motte, 74 points behind defending champions New Zealand after a vital silver medal in the final event in the Antigone Olympic Pool, Montpellier yesterday. Shannon Eckstein, Tim Schofield, Ryan Napoleon Andrew Bowden grabbed a silver in the 4x25m Manikin Tow Relay behind Germany with both teams swimming under the old world record in a thrilling final event on the program. The Aussie boys setting a new Australian record! They will also be buoyed by the eight-gold medal haul by the Australian Youth team that blitzed all-comers in the two days on the beach and included a total of seven gold to Sydney’s latest star Georgia Miller, to wrap up their beach campaign. The Australian SERC team (Simulated Emergency Response Competition), led by Shannon Eckstein, included experienced trio Andrew Bowden (Bronte SLSC/The Hills LSC), Christina Ruiz (Northcliffe SLSC/RLSS Qld) and Pamela Hendry (Maroochydore SLSC/Brisbane Lifesaving). The team were hunting for their fifth straight victory in this event but had to settle for silver behind a French team that has shown the world they mean business in the chase for overall honours with Germany taking third place. France will take a lead of 100 points into the two-day beach competition ahead of New Zealand, Germany with Australia in fourth. But importantly in Australia’s points chase, they have picked up 14 valuable points on the Kiwis, who were 13th overall in the SERC. Instead of behind 88 points down, they are now 74 which is still a monumental task. “In rugby league terms, it’s like being 30 points down and scoring a vital try just before or after half-time,” said Australian Head Coach Danny Short. Short has revealed he is now considering using Olympian Ryan Napoleon in the water events with the Currumbin Beach Vikings/RLSS Qld recruit and Olympian coming into contention for Australia’s surf race and rescue tube rescue events. The Australians will start with its big guns first up on the beach with four-time Australian single ski champion and K2 World Championship kayak silver medallist Lachlan Tame lining up alongside the versatile Eckstein in the single ski. Tame, a prospective Rio Olympian, has developed into a valuable component in Short’s plans and will play an important cog in an Australian wheel that will have to hit overdrive if they are to catch the determined Black Fins of New Zealand. The Avoca Beach paddler will also line up in the board, the beach sprint, flags, beach relay and Oceanman (Taplin) Relay. For the girls it will be room mates Olympian Naomi Flood (Manly LSC) and five-time Australian representative Kristyl Smith (Northcliffe) who will be first up for the Australians on the board. “It’s great to have such swimming talent as Ryan Napoleon waiting in the wings; it just shows you how much depth we have in our swimming ranks,” said Short. Meanwhile the next generation showed that come 2016 they will be ready to step up to the mark and push for positions on the National Team after a second day of dominance on the beach by the Youth team. Eight gold medals from 10 events – including a total of seven gold over two days to Newport’s latest recruit Georgia Miller who added gold in the Women’s Oceanman, Oceanman Relay and individual surf and single ski races to her opening day wins in the board race, board rescue and rescue-tube-rescue. The future is looking very, very bright for coach Brett Dowker’s amazing Youth Team! You will see these faces and hear these names a LOT more in coming years. An amazing day for generation next saw five 1-2 finishes to the young Aussies. There was a 1-2 finish to Australia in women's Youth surf ski with Georgia Miller taking gold ahead of Prue Davies (Currumbin SLSC/RLSS Qld) in a stunning quinella. Another 1-2 for in the men's surf race with gold to Dan Collins (Redhead) & silver to Brad Woodward (Shelley Beach, NSW/The Hills LSC). Gold to Josh Brown (Byron Bay) in the single ski with Daniel Collins back in 5th in a tight group finish. Gold and silver to Georgia Miller and Chelsea Gillett (Maroochydore/Brisbane LS) 2nd who blitzed the field in the women’s surf race. Bronze for Nicole Kay (Mooloolaba) in the beach flags in a tough race against NZ and Japan That's a gold, silver and bronze for Nicole! An unbelievable sixth gold for Georgia Miller in the Oceanwoman. What a champion, who scooped the medals. 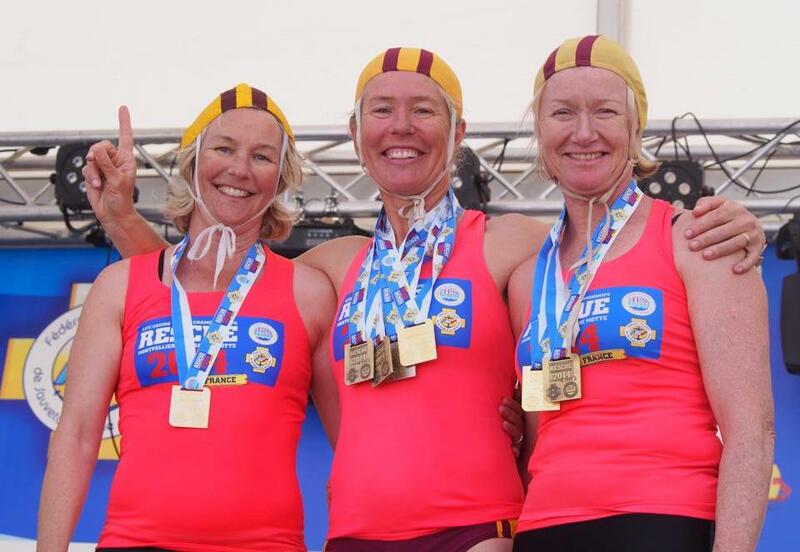 Gold for Australia ahead of South Africa and New Zealand in the Oceanwoman (Taplin) Relay and; Gold to Australia in an Amazing effort in a tight win over NZ in the Men’s Oceanman (Taplin) final. Men - Shannon Eckstein (Northcliffe SLSC) Captain, Andrew Bowden (Bronte (SLSC/ The Hills Life Saving Club) Jake Lynch (Newport SLSC) Ryan Napoleon (Currumbin Beach Vikings SLSC / RLSS Queensland), Tim Schofield (Terrigal SLSC / The Hills Life Saving Club), Lachlan Tame (Avoca Beach SLSC). Women - Miranda Bell (Northcliffe SLSC), Naomi Flood (Manly LSC), Pamela Hendry (Maroochydore SLSC / Brisbane Life Saving), Melissa Howard (Kurrawa SLSC), Christina Ruiz (Northcliffe SLSC / RLSS Queensland), Kristyl Smith (Northcliffe SLSC). Men - Joshua Brown (Byron Bay SLSC), Daniel Collins (Redhead SLSC), Matt Davis (Northcliffe SLSC / RLSS Queensland), Jason Gough (Mooloolaba SLSC), Nik Green (Alexandra Headlands SLSC), Brad Woodward (Shelley Beach SLSC / The Hills Life Saving Club). Women - Prue Davies (Currumbin Beach Vikings SLSC / RLSS Queensland), Chelsea Gillett (Maroochydore SLSC / Brisbane Life Saving), Ela Heiniger (Byron Bay SLSC / Port Hacking Lifeguard Club), Nicole Kay (Mooloolaba SLSC), Alyssa Koenan (Northcliffe SLSC), Georgia Miller (Newport SLSC). Australian Youth Lifesaving Team Management: Head Coach: Brett Dowker (Currumbin SLSC), Team Manager: Garry Mensforth (Umina SLSC), Assistant Coach: Craig Holden (Elliot Heads SLSC), Physiotherapy: Troy Eady (Byron Bay SLSC), Beach Coach: Martin Lynch (Newport SLSC). Travelling staff members: Kitty Chiller – SLSA GM Capacity & Capability (Female Athlete Liaison – Australian Youth Lifesaving Team), Nathan Hight – SLSA Sport Manager (CEO’s Representative, Australian Lifesaving Team and Youth Lifesaving Team.